As for the contents of the basic rules, let’s take a peek under the hood to see what you can expect. It’s important to remember that all of this material is drawn from the Player’s Handbook. 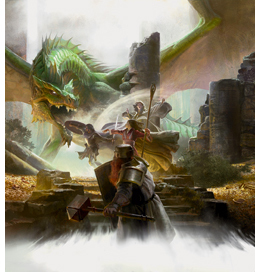 The basic rules for D&D are not a separate game, but rather are a subset of Dungeons & Dragons. Races: The dwarf, elf, and halfling each feature two subraces: hill dwarves and mountain dwarves, high elves and wood elves, and lightfoot halflings and stout halflings. Classes: Each class features one option for specialization. The fighter has the champion martial archetype, the cleric features the life domain, the rogue has the thief roguish archetype, and the wizard has the School of Evocation arcane tradition. Backgrounds: The backgrounds featured in the Starter Set pregenerated characters are included in the D&D basic rules. Equipment: The basic rules include the Player’s Handbook equipment chapter in its entirety. Rules of Play: The D&D basic rules cover combat, using ability scores, adventuring, and the rules for magic, all taken straight from the Player’s Handbook. Spells: The game provides a wide selection of cleric and wizard spells, from 0-level cantrips all the way up to the most powerful 9th-level spells.